SKU: 02466. Categories: Funnels, OXO, Utensils and Gadgets, Cooking Tools & Gadgets. OXO’s three piece multi-purpose Funnel Set is ideal for transferring and straining soups, sauces, dry goods and more. Large and small funnels accommodate any size job, and the detachable strainer fits in both funnels for added versatility. Soft ribs on the neck of the funnels allows for a secure fit in all size bottle openings to prevent spilling, and the ribs allow air to escape so liquids pour in smoothly without splashing. High-heat plastic on the funnel and strainer can withstand even steamy soup and hot fruit purees. 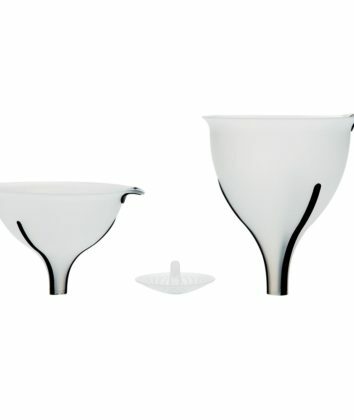 Soft handles on the funnels provide a firm grip, and the three pieces nest for compact storage.